Mr Monkey caught a bus into Manchester and scampered along to the Royal Exchange Theatre for the press night of The Night Watch. The Night Watch is Sarah Water's fourth novel, her first non-Victorian tale. 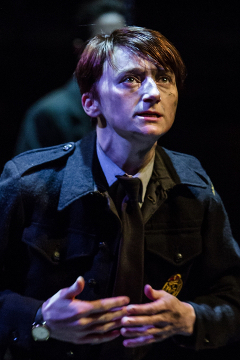 The book has been adapted for the stage by Hattie Naylor, the talented adaptor and playwright. The Night Watch shows incidents in the lives of a group of Londoners, all of whom have had contact with the central character, Jay Langrish. It starts in 1947, when relationships forged under the threat of German bombing crumble under the pressure of post-war austerity. The second act shows the relationships changing in the Little Blitz of 1944 and forming during the heavy bombing of 1941. The core of the story is the love affair between Kay Langrish and Helen Giniver, with complications involving Kay's ex, Julia, with a second group involving a fey young man and his cellmate. The majority of the characters are in some way on the fringes of 1940's society, by dint of sexual behaviour, objection to taking part in the war, or following a peculiar religion. The set for The Night Watch is a brutally simple plain raised circle. On closer inspection, there are three concentric circles which look as if they could move, and do. Odd pieces of furniture - chairs, a desk, a prison bunk - are bought on as necessary. Most notably, parts of the set can be collapsed to terrifying effect in the event of a direct hit by the Luftwaffe. The soundscape is excellent, though it does mainly feature sirens and explosions. During the final scenes there are genuinely threatening creaking sounds from above, which rather unnerved Mr Monkey. 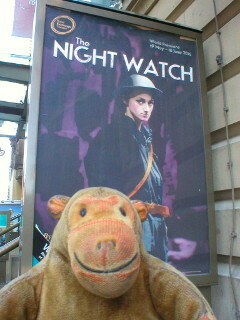 Mr Monkey found The Night Watch a compelling and involving play. He spent a lot of the first act searching for clues to the links between the characters, and most of the interval drawing a diagram of the relationships. The time structure is interesting and unusual, and Mr Monkey found it worked well. The cast are great, as you'd expect from the Exchange. 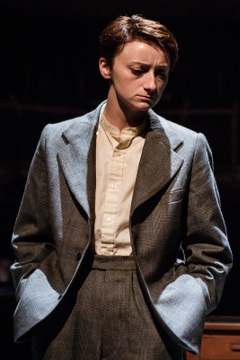 Jodie McNee is excellent as Kay Langrish, wonderfully competent when she has a purpose during the war, and horribly listless in the post-war doldrums. 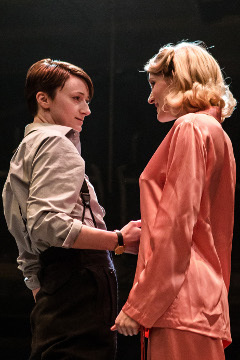 Despite playing a slightly irritating character Kelly Hotten is convincingly aggressively vulnerable as Helen Giniver, and the final scene between Helen and Kay is truly touching despite the fact that everyone has seen what happens next already. Seeing the play made Mr Monkey realise that he really should read the book as well. Mr Monkey really enjoyed The Night Watch and thoroughly recommends it to anyone who wants to see a simple but intricately presented love story. The Night Watch runs until 18th June 2016.